of the people and land he had forgotten. 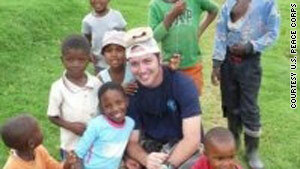 September 3rd will mark two years since ED10 Volunteer Tom Maresco was killed in Maseru. It is a tragic and somber anniversary, which I am sure Tom’s friends and family will be marking in different ways. Here in Lesotho staff and three of the Volunteers who were serving at the time will lay flowers at the site where Tom died. Tom as a vivacious person who left a positive impression on all who met him. His is missed by many and certainly by those of us in Lesotho who knew him. Please keep Tom’s family in your thoughts. Learn Sesotho – Thaba-Tseka, Lesotho from Ben Price on Vimeo. The newest edition of WorldView magazine features RPCVs and members of FOL quite prominently! Peace Corps Lesotho is officially on the web! WAS HINGTON, D.C., Sept. 4, 2010 – Peace Corps Director Aaron S. Williams is saddened to announce the death of Peace Corps volunteer Thomas “Tom” Maresco in Lesotho. Tom, 24, died as a result of a gunshot wound on Sept. 3 in Maseru, the capital of Lesotho. The investigation into this incident is ongoing, but at this time it appears it may have been an attempted robbery. Tom, of Port St. Lucie, Fla., was a secondary education teacher in the village of Katse in the highlands district of Thaba-Tseka. He arrived in Lesotho for Peace Corps service in November 2009. A graduate of the University of Florida, Tom served as a science teacher in Lesotho. He was an active member of his local community in Katse and coached youth in a number of sports including basketball and swimming. Tom became his district’s representative on the Peace Corps Lesotho HIV/AIDS committee and was committed to developing innovative ways to address HIV awareness and prevention among young people. He was scheduled to complete his Peace Corps service in January 2012. The Peace Corps is providing grief counseling and support to volunteers and staff. The Peace Corps works closely with the Department of State’s Diplomatic Security operations, the Federal Bureau of Investigation, and other federal agencies to support, as appropriate, the investigations conducted by host country law enforcement. Crimes committed against Peace Corps volunteers overseas generally fall under the legal jurisdiction of the government of the country in which the crime was committed. In this case, the government of Lesotho will conduct the investigation into this crime. There are currently 91 volunteers serving in Lesotho. Over 2,100 Americans have served as Peace Corps volunteers in Lesotho since 1967. Volunteers in this Sub-Saharan African nation work in the fields of education and community health and economic development. Geographically, volunteers are distributed throughout all 10 districts of the country. How do you spell Sesotho in Sesotho? This is an interesting question! Since the Sesotho language was not written until the arrival of the first European missionaries in 1833 (a trio of French men), there is no “native spelling” and Sesotho has only been written in Latinate characters. Even now, the only consistent variations in Sesotho spelling are slight differences between the writings of South Africa (originally transliterated by the British) and Lesotho (French). As for the internal capitalization, that is a longstanding division between white writers, and either is considered correct. Two of the foremost authorities on Lesotho use two different styles, with Elizabeth Eldredge favoring the “seSotho” spelling and Scott Rosenberg, et al., spelling it “Sesotho.” Syntax is not my forte, but the way I understand the distinction is thus: capitalizing the second S is an effort to demonstrate that the -Sotho stem is the proper noun in that thought, while se-, ba-, mo- are only prefixes (essentially the equivalent of articles) and should not be capitalized. I tend to side with Rosenberg on this, feeling that capital letters in the middle of a word are both confusing and slightly exoticizing. So, to make a long story short, the spelling “Sesotho,” “seSotho” or “SeSotho” is as native and accurate a spelling as there is. I just took a quick glance at an English-language newspaper in Lesotho and saw that they seem to prefer “Sesotho,” for what it’s worth [paragraph 11]. Author MartyPosted on August 18, 2010 Categories Lesotho QuestionsLeave a comment on How do you spell Sesotho in Sesotho?